Truth in Spirit or Blood? Within certain segments of the Neo-Pagan community there is a deeply held belief that perception is reality. I have myself, on occasion, expressed this idea in the pages of this blog. There are many roots which supply nourishment to this belief, perhaps the most important of which is that the core of almost any magical practice is the alteration of consciousness and reality in accordance with the will of the practitioner. However foundational this belief may be in magical theory, one is far more likely to find it actually practiced within the various Pagan Forums and Chat-Rooms that populate this, our worldwide web. Just pick a thread, wait for someone to make an outrageous claim (it won’t take long), call them on it, and see how quickly you are flayed alive by the crowd. Perception CAN be reality, but it can just as easily be a lie. The gods are renowned shape-shifters, the mind is susceptible to wishful thinking, and perception often shifts with a change in perspective. If we are to accept perception as reality we must make an effort to demonstrate that truth in the face of the reality which other perceive. And now I’ve used a dirty word – truth. The concept of truth scares the crap out of certain people because they live in constant fear that they will be oppressed through the tyranny of a shared reality. If some things are true and others are not, than statements like “believe what you want” and “do what you feel is right” lose their power. So let us examine what may be a relevant example from my own past, before we move on to current events. I was engaged once, to a lovely young woman whom I had been seeing exclusively for a year or so. She was funny and smart and beautiful to me in a way that made my heart sing whenever I looked at her. Probably, it was all this arterial crooning that distracted me from some very real warning signs that things were not going to work out for us in the long run. Looking back on it years later, there were several things that made me go, “hmmm,” but the one that comes to mind at this particular moment, was the thing with the Rabbi. The Thing with the Rabbi. We were still in the very early stages of planning our nuptials and there were a few very basic questions we needed to get out of the way early on. Who would conduct the ceremony, was one such question. I’m a polytheist worshipper of Celtic gods. My family is primarily composed of Catholics. And there was her immediate family of lapsed Presbyterians. So there were several possible directions from which to approach the issue. “Well, we’re going to need a Rabbi,” she said in a serious tone. Oh gods, it was this again. I’d actually forgotten. We never really talked much about religion. Neither she, nor her parents, attended services, even on holidays. She did not express an interest in religious topics when they came up in conversation. For all intents and purposes, she appeared to be agnostic. Occasionally, however, she’d claim to be Jewish. She had told me about a family friend, one of her mothers old schoolmates, who was Jewish. Through years of observation she had picked up the same accent, which she would pull out from time to time, along with a few key words and mannerisms, to demonstrate her Jewishness. 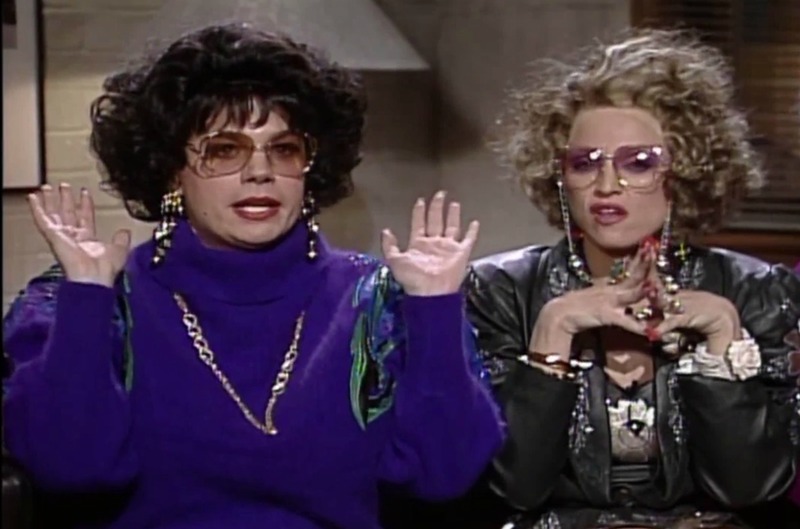 It was like watching Mike Myers doing his old SNL Coffee Talk skit. She’d suddenly lapse into this outlandish character and have us all rolling in laughter. And at first, I thought there was nothing more to it than that. But then, every once in a while, she would drop some comment into a conversation, referring either to Holocaust, or to a more general discrimination against “her people”, and it was always very personal to her, and not simply an expression of empathetic feeling toward an often persecuted minority. It didn’t happen often, and when we first started dating, I just assumed that she was Jewish. I mean, she got really excited by Christmas while never displaying a menorah, and her diet certainly wasn’t kosher, but what does any of that really prove? By the time I’d slipped that engagement ring onto her finger, I knew better. But still, it was such an infrequent dip into a harmless fantasy…, It seemed like nothing I should be worried about. And there, suddenly, in the back of my mind, I could see this little guy franticly waving a big red flag. Needless to say, I’d see more of him as time went on. She perceived herself as Jewish, and she could have been, if she’d done the work necessary to alter reality. Truth got in the way. A Simple Matter of Black or White. 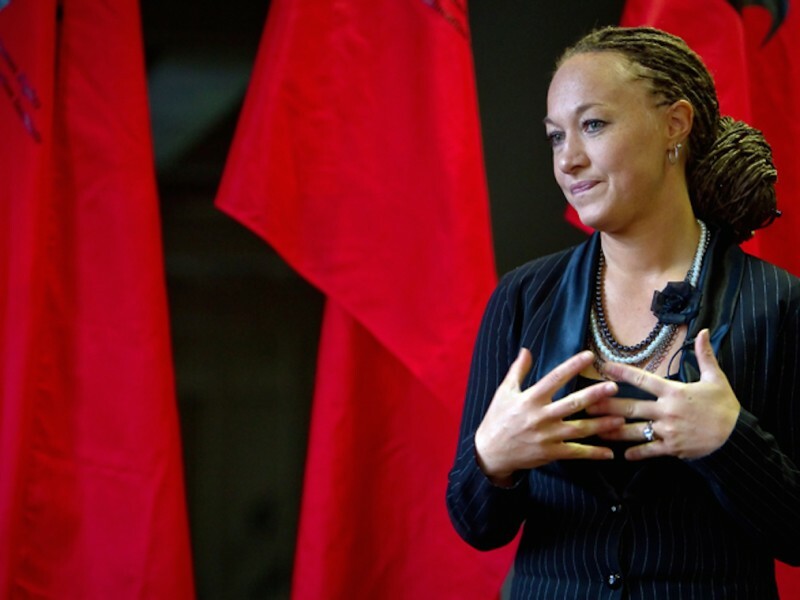 So if you have kept up with the news at all in the past several days, you must know that I have been leading us, after my own fashion, to the case of Rachel Dolezal. News sites and social media started working overtime last week, when it was learned that Dolezal, who heads a chapter of the NAACP and who has listed her race as African American on multiple forms and biographies, was born of two caucasian parents. On the surface, it seems like a simple story: Crazy white woman pretends to be black. But the truth, on this occasion, is just a bit more complex. However white her parents may have been, she was raised with four adopted brothers who were themselves, African-American. Furthermore, everything that I have read about this woman suggests that she has spent her life subsumed in African-American culture, becoming a community leader, an academic expert, and a voice of advocacy within the black community. Does active participation in a community and self identification with a particular culture trump the simple fact of her genetic makeup? And if not, if the racial signature in her blood is more important than the work she has done to integrate herself into that particular culture, then by what criteria do we determine race? Prior to the American Civil War, one was legally considered to be of mixed race if a full quarter of his ancestry was non-white. In the 20’s, the “One-Drop Rule” began to appear in legislation around the American South. And let us not ignore those voices within the African-American community who have criticized people like President Barak Obama, for not being “black enough” despite a very obvious and well documented African ancestry. What is race, and does it have any significance in the face of culture? My own ancestry is largely Celtic (Irish and Welsh), but the content of my blood would mean nothing if I did not strive to find a Celtic identity within myself. The Celts were a people of many races, linked together by commonalities in language, history and belief, a culture that stretched from Asia Minor to the British Isles, and which survives still today, in places like Ireland, Scotland, Cornwall, and the Isle of Man. I believe that something of that culture survives in me as well. But wishful thinking isn’t enough. It takes work and study to really BE something in this world. We have no control over the content of our blood, but the content of our spirit is a different matter entirely. Race may be expressed as a skin tone, as a checkbox on a census form, or as a means of oppression, but all these things are meaningless. It wasn’t a subset of chromosomes that inspired the civil-rights movement, it was a culture, a community, and a spirit that was willing to do the hard work necessary to change reality to meet its own perceptions of a better world. Is Rachel Dolezal a black woman? But if spirit along with hard work, trumps blood, as I believe it must, does it really matter?